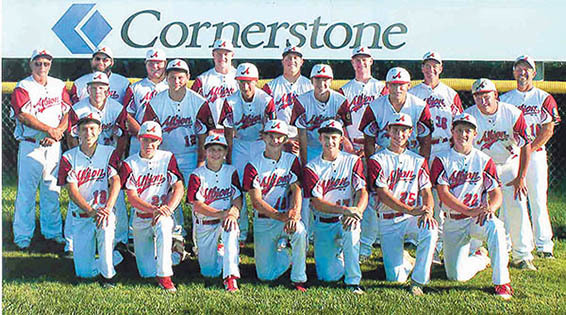 The community of Albion, local American Legion Post #162, and Albion Cornerstone Bank will host the 2018 Nebraska American Legion Class C Seniors State Baseball Tournament July 28-Aug. 1 at Leon Nelson Memorial Field (Albion Sports Complex). The field of eight teams will begin vieing for the 2018 Class C American Legion Seniors state championship Saturday with four first-round games. Four more contests will be held Sunday in double-elimination format winner’s and loser’s bracket games. Play will continue through Wednesday, when the tournament championship will be decided in one or two games, beginning at 5 p.m.
As host of the event, the Albion Cornerstone Legion Baseball Seniors receive an automatic berth in the tourney field and will play their first game Saturday at 8 p.m. against C4 Area champion Wilber. Cornerstone will take a 16-9 record into the tournament.